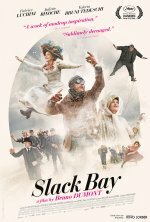 Slack Bay release date was Friday, April 21, 2017. This was a Limited in theaters release. The bourgeois and extremely eccentric Van Peteghem family—among them Juliette Binoche, Fabrice Luchini, and Valeria Bruni Tedeschi—have settled in for another summer at their cliff-top villa overlooking the picturesque Slack Bay. Their leisurely rhythm of sunbathing and seaside constitutionals is soon interrupted by the arrival of two bumbling inspectors investigating a string of tourists gone missing (and serving full-on Keystone Kops). As the macabre mysteries mount and love blossoms between the family’s genderqueer teen and the son of a local fisherman, Binoche and company ratchet the slapstick up to eleven.